This breathtaking footage shows the moment a young dolphin was rescued after washing up on the beach. 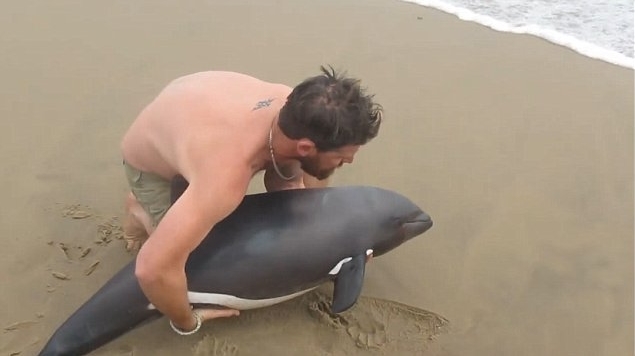 The marine mammal was found on a beach in Namibia and given a helping hand back to health. Tour guide Naude Dreyer of Pelican Point Kayaking spotted the animal and leaped into action on Wednesday, gently scooping it up and sending it back out into the surf. They wrote: "On our way back from tour this morning, we came across this juvenile male Benguela Dolphin, still alive on the beach. "I was not very hopeful, but as soon as he got into water and realised where he was, he took off like a bullet." They added that they would drive past the area later just to make sure the young created hadn't returned. Responses to "Young dolphin rescued by quick-thinking tour guide swims away safely in touching footage"